Dr. Dobleman is proud to be the first doctor in Omaha and surrounding areas to offer Balloon Dialation for patients that suffer from Eustachian Tube Dysfunction, or ETD. 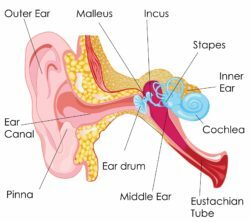 Patients experiencing Eustachian Tube Dysfunction typically complain of ear pain, ear pressure, dulled hearing and frequent ear infections. Eustachian Tube Balloon Dilation is a minimially invasive procedure changes the way physicians treat ETD. Until now, doctors would do the best to treat the conditions of ETD, but this new balloon dilation system can now address the root of the problem with the Eustachian tube itelf. The Eustachian Tube Balloon Dilation System uses balloon catheter technology to dilate the tubes by inserting a small balloon into the tube and inflating the balloon. The device also offers the flexibility to adapt to varying tube anatomy to help Ear, Nose & Throat (ENT) surgeons minimize any trauma.